A good propagation medium is made up of components that provide optimum aeration, drainage and moisture holding characteristics. These are usually made up from combinations of peat moss, perlite, vermiculite, sand or similar materials. The primary role of a propagation medium is to provide support and moisture while the plant is developing. These requirements are quite different from those of a potting medium, which may have to sustain a mature or growing plant over a long period of time. Generally speaking, potting media are not recommended for plant propagation purposes. Many plants will easily root in water. However, the roots that form can be extremely fibrous and stringy. Plants rooted in water often have a difficult time becoming established after they are transplanted to a container. The propagation medium should be thoroughly moistened before use. Many organic materials, like peat moss, have a waxy outer coating that resists wetting. Be sure to apply water slowly to obtain uniform distribution. This may require 2-3 applications. It is not uncommon for a medium to look wet on the surface but to be powdery dry in the middle. A well moistened media will make it easier to stick cuttings later on. Light is an important environmental factor in plant propagation. Generally speaking, low light levels cause plants to root slowly. However, high light intensities can stress cuttings, causing them to burn or drop leaves. Diffused sunlight generally provides enough light for optimum rooting without causing injury to the cuttings. Since cuttings do not have roots, they cannot replace the water lost through transpiration. Therefore it is important to maintain high humidity around the cuttings to cut down on the amount of moisture lost to the atmosphere. These conditions can be provided by placing a clear piece of plastic over the propagation area. This causes condensation to form on the underside of the plastic that provides the necessary humidity. Adequate ventilation is also required to avoid disease problems. The plastic covering should be placed such that air can flow freely around the cuttings as they root. For best results, maintain day temperatures at 70 degrees F. During winter months, soil can be as much as 10-20 degrees less than air temperature, so provide bottom heat when possible. Ideal rootzone temperatures for most plants are approximately 70-75 degrees F.
Rooting hormones are often used to promote root formation. These materials provide supplemental auxin, a naturally occurring plant hormone that is responsible for root development. 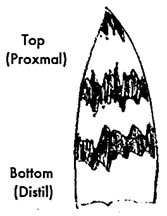 The basal end of the cutting is dipped into the chemical prior to sticking it into the propagation medium. These products come in different strengths and will vary according to the type of plant being propagated. There are two types of stem cuttings: tip cuttings, which include the apex or plant tip and a small portion of the stem; and section cuttings, which include a 2- to 3-inch section of stem (not including the apex or plant tip> and leaf joint. To take a tip cutting, select a section of stem with a healthy crown of leaves at the end. Carefully remove the lower foliage to leave a section of bare stem to insert into the propagation media. Bottom heat, provided by a heating cable, will encourage rooting. Generally, cuttings do best with a media temperature of approximately 75 degrees F.
Asterisk* indicates these are particularly easy to propagate. Many plants with soft, fleshy foliage have developed the ability to reproduce themselves from leaves. Considering that some plants grow hundreds of leaves, you can appreciate the propagation potential for these species. In addition, leaf propagation is much faster and more reliable than propagating plants from seed. The most widely practiced method of taking a leaf cutting is to snip off a healthy leaf, complete with a short piece of stem. The end of the leaf cutting is then dipped in a rooting hormone and the stalk is stuck in to a moist propagation media. Bottom heat of about 75 degrees F should be provided if possible. Adequate humidity levels are maintained by frequent water sprays, or by covering the propagating tray with clear plastic. After about two or three weeks the leaves should be well rooted with a new plant forming at the base. It is these new plantlets which form around the stem which are used to transplant. The old leaf can be discarded. Plants which root most readily from leaf cuttings include African Violets and Sansevieria. Leaf cuttings of African violets root so readily, they can simply be suspended in a well aerated, jar of water. The suspended leaves can be supported by simply covering the mouth of a jar with foil or paper held in place with a rubber band. Holes are easily punched in this covering, and the leaf stems inserted so the bottom of each leaf stalk touches the water. Sansevieria is another interesting plant that can be started from leaf cuttings. The leaves are long, leathery and sword-shaped. Just select a whole leaf and then cut it into 2-inch sections starting from the tip all the way down. Remember...if cuttings are stuck upside down they will not root. Leaf cuttings can be literally crowded together, almost shoulder to shoulder. This crowding will not harm them, and once the root systems have been developed they can be separated for transplanting into individual pots. take a leaf and cut it into sections, each section with a vein. 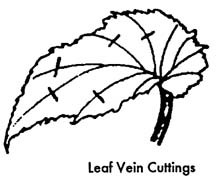 The bottom portion of the vein can then be pressed into the propagation medium with the leaf portion sticking up to root just like a leaf cutting. In this manner one leaf can produce up to a dozen new plants. choose a large leaf and slash the veins at 1 or 2 inch intervals on the underside of the leaf. Place the underside of the leaf in contact with the propagation medium and weight down the leaf to keep it in contact with the soil. New plants will spring to life at each cut in the leaf.